Can Israel-Arab peace be built from the grassroots up? (February 21, 2019 / JNS) Israel’s Prime Minister Benjamin Netanyahu “breaking bread” with Arab leaders at the Warsaw conference on Middle East security was a warming and unprecedented sight. But no sooner had a video been leaked online of a friendly interaction between Netanyahu and the Yemen foreign minister than it was deleted. This is symptomatic of the push-me, pull-you relationship between Israel and its Arab “frenemies.” Two steps on the road to normalization, two steps back. 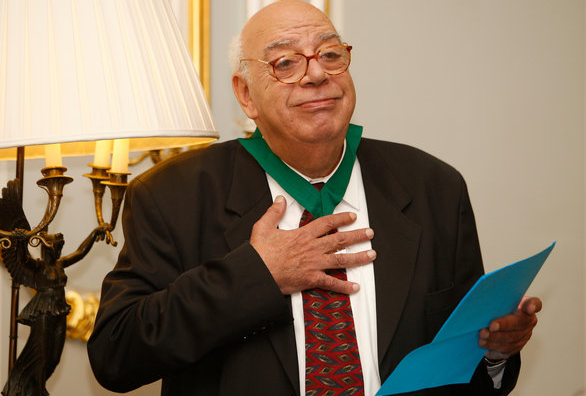 In February, an Iraqi poet who had written about the Jews of his country was murdered. At about the same time, Egyptians complained that the Israeli ambassador had attended the Cairo Book Fair, albeit he had queued to buy an admission ticket like other members of the public. “If we had known, we would have beaten him up,” they wrote on social media. On the other hand, since the Arab Spring, a startling revolution has been taking place regarding Arab attitudes to Jews and Israel. “The seeds are unmistakably sprouting,” says broadcaster, author and Middle East specialist Joseph Braude. As well as a top-down strategic rapprochement in the face of the Iranian nuclear threat, social media is penetrating from the outside in. The Arabic Facebook page of the Israeli Ministry of Foreign Affairs has 1.7 million followers from all over the Arab world, with more joining all the time. The Arabic page of JIMENA (Jews Indigenous from the Middle East and North Africa) has 5,000 new followers every week. The Dove Flyer, Eli Amir’s novel set in 1940s Iraq, has been translated into Arabic, as has Lucette Lagnado’s Egyptian memoir, The Man in the White Sharkskin Suit. Braude sees an unprecedented opportunity to foster change. 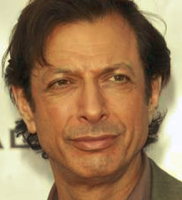 He views culture as fluid. The new subculture is driven by revulsion at Islamist terrorism, fear of Iran and its nuclear designs, and recognition of the Holocaust. Reversing the thinking that peace is a prerequisite for cultural change, the United States could help build a coherent policy on a peace between peoples. In his monograph Reclamation, Braude pulls out a tool kit of instruments that America might use to encourage partnership between Arabs and Israelis. Morocco is an anomaly worthy of emulation. There, the monarchy has fostered a culture of moderation towards Israel, and in the face of powerful counter-currents of rejectionism, has caused an anti-normalization bill in parliament to be shelved. Such optimism is not shared by Israeli researcher and commentator Edy Cohen. The road to better relations is littered with empty promises. The Arabs are in distress. As soon as it is no longer expedient to do so, they will drop Israel like a hot potato. “If we haven’t learned from past experiences, let us at the very least read the present situation correctly,” he writes. But Arab expressions of sympathy remain rare. As long as individual advocates for normalization with Israel put their careers—or even their lives—on the line, the price of significant change will remain too high. Can American pressure make the price for intimidation and ostracism even higher? It’s worth a try. Calev Ben-Dor (CB-D): Your new book Spies of No Country tells the story of four young Jewish men from the Arab world who form the beginnings of Israel’s spy network. What drove you to focus on this? Matti Friedman (MF): The book follows four of Israel’s first spies through the 1948 War of Independence. The main characters are young men on the margins of the Zionist project who are recruited by a small, ad-hoc intelligence outfit within the Palmach called the Arab Section, which encourages Arabic-speaking Jews to cross enemy lines and gather intelligence in the Arab world. They actually don’t call themselves agents, but Mistarvim, which means ‘ones who become like Arabs’ and it’s a term used today, made famous by the TV hit Fauda. At its height at the onset of the war, the section was no more than 20 agents, only half of whom survive. Their mission expanded to attempted assassinations of Arab leaders, and in Haifa they carried out a pre-emptive attack on a garage where the Arab militia was preparing a car bomb in the spring of 1948. And then when Haifa fell to the Haganah in 1948 and the Arabs begun to flee, the people in charge of the Arab Section realised that they have an opportunity to insert their agents into the Arab world by disguising them as refugees. They ran away to Lebanon and spent the first two years of Israel’s existence as Palestinian refugees, so the way they experienced the birth of the state is radically different to most of the stories people have heard about at that time. For many years, I have had the feeling that the stories we tell about Israel no longer explain the country; nor are they useful as a map for navigating the country in 2019. Israel has always told its story in a very European way, about socialism, Theodor Herzl, the Holocaust, the Kibbutzim. That is very important if you want to understand how the country was founded, but it doesn’t explain the society that we live in. So I was looking for other stories that would explain the state of now, particularly from the Middle Eastern perspective, which reflects the fact that half of Israelis today actually come from the Islamic world rather than from Europe. In 2011 I met a 90-year-old former spy, Isaac Shoshan, who lives in a small working class suburb of Tel Aviv with whom I had a series of fascinating conversations. Isaac told me a story about the founding of the state that I hadn’t heard before. He experienced 1948 as a Palestinian refugee, which was his job as part of the very small, embryonic intelligence outfit that as part of the Jewish military underground and that story struck me as worth telling. CB-D: I recently interviewed Yossi Klein Halevi about his book, Letters to my Palestinian Neighbour and one of the things he emphasised was how he wanted to tell a 21st century Zionist story. You touched on this earlier, in that the story often told is overly Euro-centric – the narrative begins with the pogroms in Russia and ends with the Holocaust. Your book, which is different in many ways, has a similar idea in that if we are to tell the story of Israel today – both to Israelis and outsiders – we need to make it more accurate to include a Mizrachi component. MF: People still tell the story of Israel as: When the Jews of the Islamic world moved to Israel they joined the story of the Ashkenazim – so the story of Israel is the story of the Jews of Europe. But having thought about this, and having lived here for 23 years, it is clear to me that what actually happened is much closer to the opposite. The remnants of the Jews of Europe come to the Middle East and inserted themselves into the story of the Jews of the Islamic world. The State of Israel is shaped by our contact with Islam and Jews who have lived here for centuries. The dominant narrative of the European Jews is wrong. CB-D: Something that struck me while reading is the how the story of the Jews from Arab lands end. You remind readers that these Jews had survived a lot of crises – they had been present before the conquest of Islam, and even before the destruction of the Second Temple in 70 CE. There is nothing inherently to suggest that they shouldn’t also have been able to survive the establishment of the State of Israel. Yet now, when we look back, we see it as inevitable that they would not be able to continue to live in the Arab world. But in 1947, for the heroes of the story, it was far from clear that we were approaching the end of Jewish presence in Arab lands after 2,000 years? MF: In 2019 it is clear to us that if the state of Israel exists then the Jewish presence in the Arab world isn’t going to exist. This was a world of about a million people in the 1940s – almost every major Arab city has a Jewish quarter, with some estimates putting the Jewish population of Baghdad as a third. The idea that this was going to suddenly disappear at the time was crazy. And we should remind ourselves of the fact that it did vanish is crazy. If you grow up in a Western Jewish community you’re very much aware of the loss stemming from the Holocaust, but less aware and appreciative of the loss of the smaller and much older Jewish world in the Middle East, which was alive and well into the 1940s. The remnants of that world are largely here in Israel and they and their experiences are a very important part of the life of the country. It’s one of the things that makes this county different to a Western Jewish community, and why Westerners sometimes who struggle to get their heads around the country. These spies are a way of talking about all of that. They see it collapse. When they leave Palestine in 1947, they still see that world intact, but when they return to the State of Israel in the 1950s that world is doomed. That collapse of that world has both incredible significance for the Middle East and huge impact on the development of the State of Israel. CB-D: In addition to Israelis and Westerners having to shift their perception about Israeli society, there is a third component you mention in your book that needs to be shifted, namely those within the Arab/Muslim world who view Israel as a Western implant rather than a country populated by people indigenous to the region. You talk about a mural in Egypt showing Egyptian soldiers crossing the Suez Canal in 1973 and facing blond Israeli soldiers. You point out that Israelis are generally not blonde, but it helped the Arab world to see Israel as a European story. MF: There are two main reasons why the Arab world has tried so hard to portray Israel as a colonialist implant: the first is that it help plays on European guilt for what happened in the Second World War; the second is that it obscures their own responsibility for why over 800,000 Jews, most of whom came to Israel, lost their homes in the Islamic world. Once you understand what happened, you will have a lot of criticism of Arab states for what drove out the Jewish population, so in order to make that go away, the Israelis have to be portrayed as blonde. Rather than blonds, many of those soldiers fighting the Egyptians on the Suez Canal looked like Egyptians (in fact some were originally from Egypt). So this a purposeful attempt by the Muslim world to erase that history, which suggest their own culpability in this story. The New York Times examines the still unresolved Yemenite children affair,in which hundreds of families arriving in Israel in 1949/50 were told that their babies had died - when they had been taken away for adoption. But suggestions that there was a conspiracy by the authorities to abduct the children remain unproven. 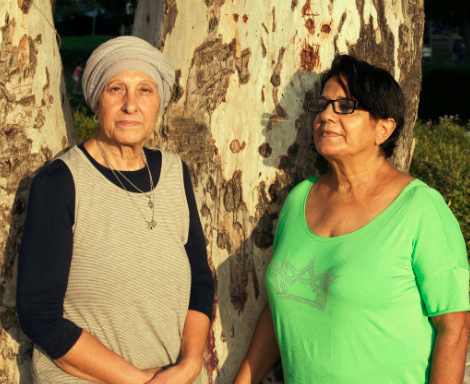 ROSH HAAYIN, Israel — Ofra Mazor, 62, had been looking for her sister, Varda, for 30 years when she submitted her DNA samples to the Israeli genealogy company MyHeritage in 2017. Her mother, Yochevet, who is now deceased, said that she got to breast-feed her sister only once after giving birth to her in an Israeli hospital in 1950. She was told by the nurses that her newborn daughter had died. Ms. Mazor’s mother didn’t believe the nurses and had her husband demand their child back. He was never given the child. A few months after submitting her DNA, Ms. Mazor received the call she’d been waiting for: A match had been found. Last January, the sisters were reunited. Varda Fuchs had been adopted by a German-Jewish couple in Israel. She was told at a young age that she was adopted. The sisters are part of a community of Israelis of Yemenite descent who for decades have been seeking answers about their lost kin. If Jews are interested in establishing a Jewish community in Egypt, the government will build synagogues and other communal institutions, Egyptian President Abdel Fattah el-Sisi told a US delegation during a two-hour meeting last week. The delegation was made up of the Anwar Sadat Congressional Gold Medal Commission that advocated the granting of the US Congressional Gold Medal posthumously to the slain Egyptian president who made peace with Israel. Its members traveled to Egypt to invite Sisi to the ceremony in the fall, when the medal will be given to Sadat’s wife, Jehan. The group was headed by the founder of the commission, Ezra Friedlander, an ultra-Orthodox consultant and lobbyist from New York who spearheaded efforts to have the award granted to Sadat. This required the passage of a bill that needed to be sponsored by two-thirds of Congress and was signed by US President Donald Trump in December. Some good news at last: Following a historic meeting with two dozen American Jewish leaders, President Sisi of Egypt has given the green light to the cleaning up of Bassatine Cemetery in Cairo: The American Jewish Committee (AJC) commends Egyptian President Abdel Fattah al-Sisi's decisions to clean and protect the historic Jewish Bassatine Cemetery in Cairo and to make available the country's Jewish Communal registers. 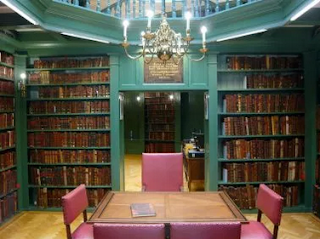 AJC, the global Jewish advocacy organization, has long called for these and other measures to preserve the heritage of the Egyptian Jewish community, which once numbered more than 80,000 and today is estimated to be fewer than 20. 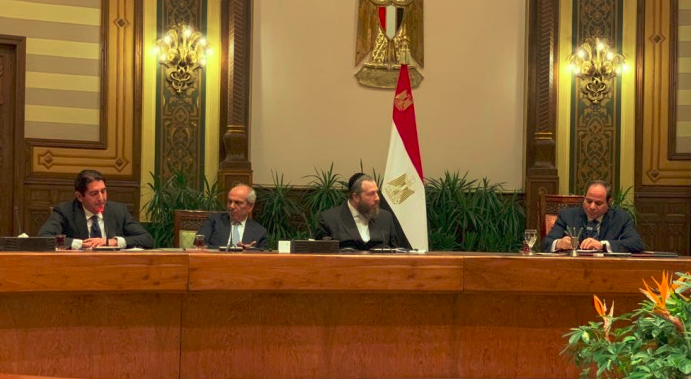 Egypt's commitment to preserve Jewish sites and records is vitally important," said Rabbi Andrew Baker, AJC Director of International Jewish Affairs, who has visited Cairo. AJC also has raised these issues in meetings with Sisi in the past. 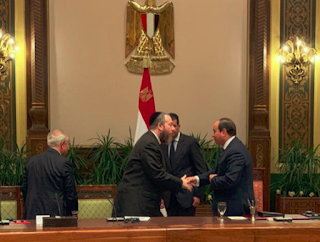 Sisi's announcement this week followed his meeting with a delegation of Orthodox Jews visiting from New York. Bassatine Cemetery, which dates to the ninth century, contains thousands of Jewish graves. Neglected for years, most of the inscribed headstones have been looted and squatter's apartments cover much of the original site. Broken walls leave it unprotected, and garbage is strewn throughout the cemetery. 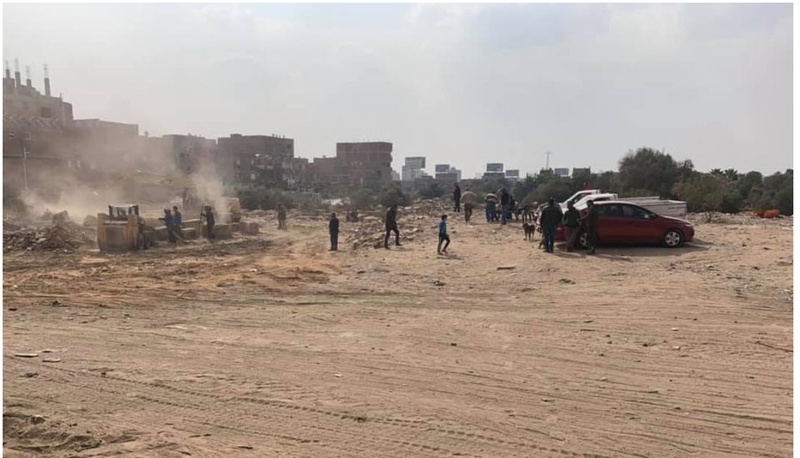 One day after Sisi's announcement bulldozers and other equipment were dispatched to the cemetery to begin the clean-up process. The Communal Registers contain important personal data, including births, deaths and marriages, of the Jewish Communities of Cairo and Alexandria. "For many Egyptian Jews these are the only formal records which might otherwise be inscribed in civil records. And there are cases where they are very important in proving a person's Jewish identity, for burial or for marriage," Baker said. Access to this official documentation is important to the religious life of Egyptian Jews and their descendants around the world. AJC, together with the Nebi Daniel Association of Jews from Egypt, the Jewish Community of Cairo, and the Consistoire of France, has called for a copy of the registers to be deposited with the Chief Rabbinate of France. AJC expects that Sisi's decision will lead soon to implementation of the Egyptian Ministry of Culture's unfulfilled promise to AJC in May 2017 to allow the registers to be copied. Drawing on the Jewish people’s ancient links to Egypt, Henry Manoucheri, a leader in Los Angeles’ Persian Jewish community, told Sisi that Egyptians and Jews are linked by a common historic bond that connects their souls. Manoucheri said that he found Sisi to be positive, emotional and clever, blessing him with a long life and many years in the Egyptian presidential palace. Sisi politely refused Manoucheri’s offer to cover the cost of much needed repairs to Egypt’s dilapidated Jewish cemeteries. 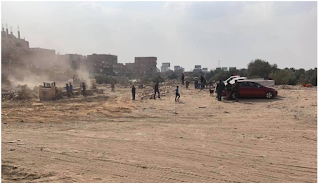 Two hours later, the requested work was already underway at the cemeteries, reported New York City’s City Planning Commissioner Joseph Douek, a member of Brooklyn’s Egyptian Jewish community who was also part of the delegation. “Representatives of what is left of the local Jewish community told me that shortly after our meeting, they received a call from the municipality saying that the work had started and that the local Jewish community would be called in to inspect their efforts,” said Douek, the great nephew of Egypt’s last chief rabbi, Rabbi Haim Moussa Douek. Douek also spoke with Sisi about the return of several Torahs and archived documents that are being held in Egypt but was told that those items would remain in the country. “He told me that they were all being well maintained and well preserved, something that I know for a fact to be true,” said Douek. Lebanese born Rabbi Elie Abadie, rabbi of Manhattan East Synagogue, head of the Sephardic Academy of Manhattan and president of Justice for Jews from Arab Countries, conversed with Sisi in his native tongue, inviting him to Washington to see the Congressional Gold Medal and explaining its significance. “I told him that we appreciate his strategic alliance with Israel and his friendship with the Jewish people,” said Rabbi Abadie. 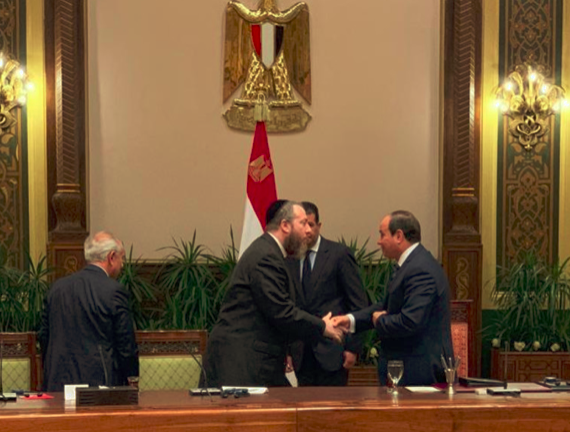 Ezra Friedlander said that the meeting surpassed all of his expectations and that he was grateful for the opportunity to be able to demonstrate American Jewry’s staunch support for Sisi and the pivotal role that he plays in the Middle East and in addressing terror worldwide. Today’s generation of Jews are experiencing an anti-Semitism renaissance. Although Western reckoning with the Holocaust temporarily forced overt Judenhass underground, anti-Semitism was far from finished. It began its slow, steady climb back into mainstream consciousness by the late ’60s, and is now acceptable in polite society once more. Anti-Semitism has undergone yet another mutation. At the heart of this newly revitalized anti-Semitism is anti-Zionism, a self-professed “anti-imperialist” ideology aimed at dismantling the State of Israel. Dressed in hip social justice frippery, anti-Zionism has proved to be an effective conduit for anti-Semitism, simultaneously appealing to old school anti-Semites while seamlessly adapting itself to modern cultural sensibilities, thus resonating with younger generations and bringing many new converts into the fold. It certainly makes for a romantic story, one that manages the nearly impossible feat of appealing to oppressed peoples throughout the world, while also reeling in classic racists with a familiar villain. It is, however, quite false. What Zionism DID do is uproot centuries-old power structures, restoring a native people back to its land and overthrowing a 1,000+ year old colonial occupation. It not only gave one of the most abused and widely despised minorities in the world a sizable chunk of its land back, it gave them power. And in the eyes of anti–Semites, Jews are not supposed to have either of these things. As with other successful liberation movements (e.g., feminism), the resistance against Zionism has been, and continues to be, ferocious. Anti-Semites on both ends of the spectrum — and both ends of the globe — have made it more than clear that they will stop at nothing to see Israel destroyed, and the Jews restored to their rightful place at the bottom of the totem pole. And they decided that only way to do this would be to re-ignite anti-Semitic passions throughout the world (or at least, bring them out of hiding) and recruit them to their cause. But the times have clearly changed, and the old anti-Semitic rhetoric involving the foreign, non-white, conniving, sinister, bloodthirsty Jew was in dire need of a contemporary makeover. In today’s climate, it is no longer acceptable (or wasn’t, until just a few years ago) to openly advocate white supremacy or advance the “inferiority” of people of color. These views are now (rightly) considered retrograde, chauvinistic, and morally reprehensible. Instead, the locus of what is considered undesirable and abhorrent has shifted to white supremacy, along with all of its trappings. Jews, having been traditionally despised as primitive, static, Oriental “outsiders,” can no longer be seriously harmed by these arguments. Right-wing anti-Semites would remain on board (as they would have anyway, since their values haven’t really changed much), but the center-left, progressives, and other minorities would have immediately rejected it. If anything, it would have increased their sympathy for Jews (and thus, their sympathy for Israel). A change was obviously needed. To this end, Jews have been stripped of their indigenous Levantine ethnic identity and reduced to a religious faith, whose adherents are merely: “Slavs, Germans, Italians, Arabs, and Berbers who just so happen to practice Judaism.” Ashkenazim by extension are situated as “white Europeans” who — despite their “very unfortunate” experiences throughout history — are recast as part of the white European ruling caste. And from there, Zionism is delegitimized as a “European colonial movement,” since political Zionism was born in the European exile, and Ashkenazim were arguably the driving force behind Israel’s re-establishment. In this current epoch, wherein white supremacist power structures are grappled with on more of a mainstream level, Jews (Ashkenazi Jews in particular) are once more cast as the villain, if not “the brains” behind it all. This is in spite of the fact that these very same structures have, and still do, harm Ashkenazim — and Jews more broadly. Reframing Ashkenazim as “white Jews” in the 21st century carries an array of benefits to the anti-Semite — many of which I have written about previously — that simply weren’t available decades ago. 1. It implies that Ashkenazim are not really ethnic minorities at all, thereby robbing them of the critical protections that such a status would accord. 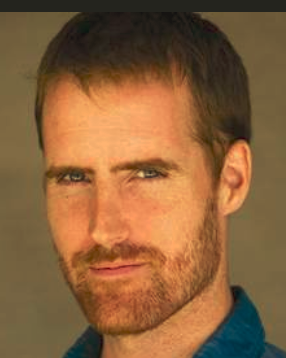 For example, a “white Jew” who complains of anti-Semitism or otherwise gets too uppity can be swiftly shut down with “you’re white, stop centering yourselves.” This is why you’ll often hear ludicrous claims like “the Holocaust is a white on white crime,” thereby diminishing its overall significance in the social justice arena. 2. It has the effect of bleaching out their indigenous Middle Eastern roots. Stripping a people of their entire identity, history, and lived experiences by conflating them with their captors and oppressors is both dangerous and morally unacceptable. That should go without saying, and it stands to reason that few, if any, would consider whitewashing Arabs, Natives, or (hypothetically) Africans in this way. But this is done to “white Jews” on a regular basis. Labeling the vast majority of Israel’s founders “white European” reaffirms the premise of anti-Zionism (that Zionism is essentially a settler-colonial enterprise), thereby leaving Zionism vulnerable to attack. This, I assume, is the entire point of the term “white Jews,” and accounts for why the term is so vigorously defended. 4. Minority anti-Semites get a free-pass. In other words, it can be excused away with “they have no institutional power, which white Jews have in abundance” (more on this below). Anti-Semitism then becomes a form of “punching up.” In summary, the term “white Jew” renders its target completely and utterly vulnerable. That’s why the debate over Ashkenazi “whiteness” (or lack thereof) has become such a hot-button topic. The conception of Ashkenazim as “white Europeans” (and Jews more broadly as “just a religious faith”) is at the very heart of the anti-Zionist movement, and of America’s contribution to this millennia-old prejudice. It is not an innocuous debate by any means. It is simply the latest battle in a very old war. Anti-Semites of today NEED Ashkenazim to be “white” because anti-Semitism cannot flower otherwise. The names of the men and women murdered by the Iraqi regime 50 years ago rang out in the crowded congregation of Bevis Marks on Tuesday night. And many of those in the centuries-old synagogue, the families of the dead, wept as they paid tribute to their loved ones, hanged, murdered while in custody, or simply missing, their fates unknown. One of the key results of the killings — which began in January 1969 with the public hangings of 15 men, nine of whom were Jews — was the fleeing of the majority of the Iraqi Jewish community (Only 3,000 of a 150,000 -member community remained by the late 1960s - ed). Many of them began new lives in Britain. In an emotional keynote address, Rabbi Joseph Dweck, senior rabbi of the S&P Sephardi community, recalled the glory days of the Iraqi Jewish community, the cornerstone of diaspora Jewish scholarship for hundreds of years, and “part of the national psyche of the Jewish people”. For centuries, he said, “we not only survived in Arab lands, we thrived”. He spoke of the “glory and grandeur of Jewish life in that country”, but, while acknowledging the pain and suffering of the loss of that life, urged the community to “stand taller, not slouch, be stronger, not sad. Lift up your hearts”. 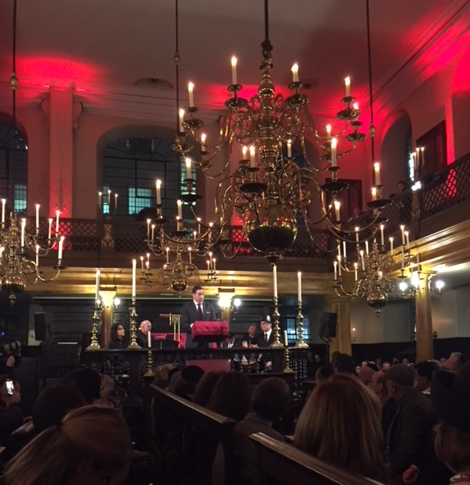 The evening began with a candle lit by the S&P Sephardi community president, Sabah Zubeida, in memory of Ezra Naji Sion Hesqel Zilkha, and his own father, Daoud Sassoon Zubeida. The January 27 1969 hangings had been “the beginning of the end” for Iraqi Jewry, he said, a “terrifying time, in which Jews were the easiest target”.The bodies of the nine Jews hanged on that January day 50 years ago were returned to the Jewish community for burial. But many more, who died at the hands of the regime in prison or were simply rounded up and killed, were never seen again, never buried — but always mourned. In tears, Samira Elias lit a candle in memory of her brother Hesqel Salih Hesqel and her sister Suad Kashkush; Faiza Saigh lit one in memory of her brother, Daoud Ghali Yadgar, and Nouri Dallal lit a candle in the name of his brother Daoud Hesqel Barukh Dallal. 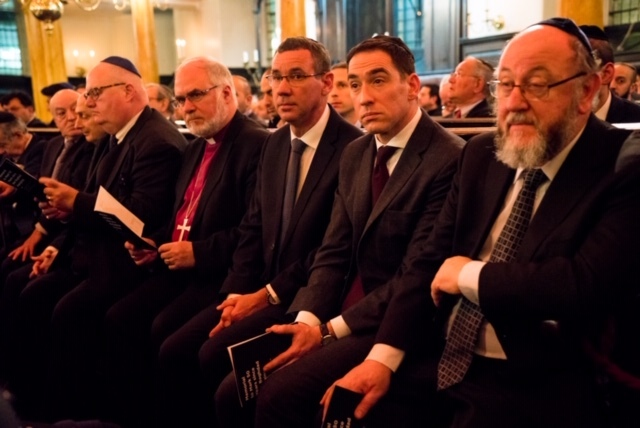 Other candles were lit by Chef Rabbi Ephraim Mirvis, who recited Psalm 137; Rabbi Abraham Levy, who had, as a young man, led a demonstration against the hangings outside the Iraqi embassy in London, but who today also rejoiced in the contribution made by Iraqi Jews to Britain’s Jewish community; Bishop Graham Kings, representing the Church of England; Lord Pickles, the UK’s special envoy for post-Holocaust issues; and Israeli ambassador Mark Regev, who spoke of Iraqi antisemitism and its echoes today, in “vile tropes on social media, relating to dual loyalties and undue influences”. The actor and musician Noa Bodner linked the event with a series of readings outlining the terrible events of January 1969. A memorial prayer was led by the rabbi of Lauderdale Road Synagogue, Rabbi Israel Elia, while Rabbi Dweck recited kaddish. Before the demise of the Jewish communities of the Middle East and Mediterranean regions in the middle of the twentieth century, their migration away from their countries of origin, and their resettlement in the West and Israel, the Sephardic ḥakhamim and intellectuals produced an immense literature that spanned the whole range of traditional Jewish learning: Biblical exegesis, Talmudic commentary, halakhic treatises and responsa, musar (ethics), philosophy, Kabbala, grammar and poetry. It is known that this literature’s history extends back to the early Middle Ages, to the era known as the ‘Golden Age of Spain’ (more specifically Al-Andalus), when the Muslim Middle East was the world center of dynamic intellectual creativity, in which the Jews were engaged as much as their Muslim and Christian neighbors, and out of which came such luminaries as Maimonides, Seʿadia Ga’on, R. Yehuda HaLevi, and Bahya ibn Pakuda, whose works have become Jewish classics and are well-known and studied to this day. What is less well-known is that, while the ‘Golden Age’ may have gone into decline, intellectual creativity never ceased in the Sephardic world, and continued down to modern times- contrary to the perception of Sepharadim which prevails in today’s Ashkenazi-dominated Jewish world, according to which Sepharadim are, almost by definition, conservative, tradition-bound, patriarchal, and entirely lacking a coherent response to the challenges of modernity; the latter, it is assumed, they never experienced prior to their emigration to North America, Europe or Israel. R. Moshe HaKohen Khalfon’s powerful writings on charity, social justice, and world peace (written in the wake of World War I), firmly and yet creatively grounded in Jewish thought, are almost inaccessible to most. Jewish thought that engages creatively and insightfully with modernity, we are given to understand, has been the exclusive preserve of Ashkenazi intellectuals. Most Jews today who have received a decent Jewish education know of figures such as R. Yosef Dov Soloveitchik, R. Samson Raphael Hirsch, Martin Buber, Franz Rosenzweig etc. But very few have heard of R. Yiḥya Qafiḥ of San’a, who strove to revitalize his community by promoting the classical rationalist Jewish thought of Maimonides and Saʿadia Ga’on, writing sustained and intense polemics against Kabbalah, and opening a school which taught science, mathematics, Arabic, and Turkish alongside Bible and Talmud. Not many know of Shadal (Shemuʿel David Luzzato), the head of the Rabbinical College of Padua, who promoted academic methodology for the study of classical texts in the seminary and opposed both Kabbalah and rationalist philosophy of the Maimonidean sort – or of Umberto Cassuto, a product of a similar rabbinical college in Florence, who saw no contradiction between being a strictly observant rabbi and a critical Bible scholar. Few have seen the responsa of Moroccan rabbis like R. Yoseph Messas and their fearlessness in attempting to synthesize halakhic solutions to some of modernity’s most pressing challenges, their permitting the use of electricity on Yom Ṭov, their inclusive approach to converts (including those who convert for the sake of intermarriage) and their encouragement of women who wished to study Talmud. The Tunisian R. Moshe HaKohen Khalfon’s powerful writings on charity, social justice, and world peace (written in the wake of World War I), firmly and yet creatively grounded in Jewish thought, are almost inaccessible to most.